Josiane has officiated at many funerals and memorials. 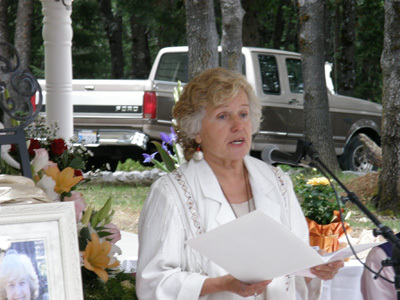 Through her ability to personalize the ceremony, she is equally comfortable performing funerals in a variety of settings including churches, indoors and outdoors, in homes and at the burial site. There are many, many rites of passage in our lives: birth, leaving childhood and becoming an adolescent, leaving home, weddings, divorce, retirement and death/funerals. To recognize and celebrate these significant times in our lives, we hold ceremonies. These ceremonies celebrate the natural transitions that we humans experience and help us to stay in touch with our own natural cycles, both as individuals and as a culture, and therefore also to align with the natural world around us. Rituals and ceremonies feed our spirits, making them richer and deeper. Our rites of passage ceremonies have been created to enhance profound shifts in consciousness during times of major life changes, and to support individuals in their healing process. For more information, please call (530) 926-6871 or .